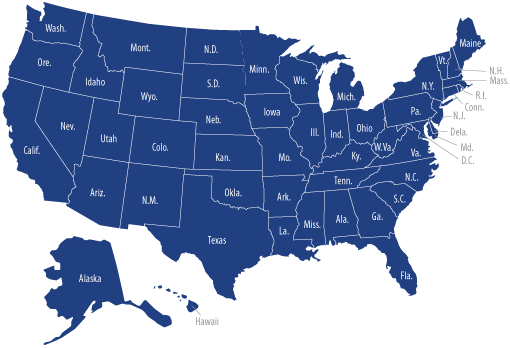 CSG's National Center for Interstate Compacts Database allows you to search more than 1,500 statutes for state-by-state interstate compact membership, serving as the most useful and innovative search tool for researching interstate compacts available. We invite you to search through the database where you will find useful, relevant information pertaining to all active interstate compacts in use today. The database provides a wide range of information and can be searched via the interactive map or advanced search options. Accompanying each compact is a downloadable .pdf of the compact statutory language. To retrieve a specific state’s compact legislation not offered in .pdf form, please follow that state’s official citation. The National Center for Interstate Compacts mission is to serve as an information clearinghouse, a provider of training and technical assistance, and a primary facilitator in assisting states in the review, revision, and creation of new interstate compacts as solutions to multi-state problems or alternatives to federal preemption and the National Center for Interstate Compacts Database serves as a vital component toward achieving these objectives. © 2011 The Council of State Governments. All Rights Reserved.